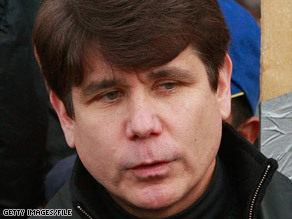 Affidavit says Blagojevich called Senate seat "a f---ing valuable thing"
(CNN) -- Democratic Gov. Rod Blagojevich and his chief of staff, John Harris, face corruption charges in a scandal that encompassed the Chicago Cubs, President-elect Barack Obama's vacated Senate seat and a children's hospital, according to an affidavit. Illinois Gov. Rod Blagojevich talks to laid-off workers in Chicago on Monday. The men were each charged with a count of conspiracy to commit mail and wire fraud and a count of solicitation of bribery, authorities said. In a November 3 conversation with an adviser, Blagojevich discussed receiving a kickback for appointing someone, identified only as "Senate Candidate 1," to the vacant Senate seat. Obama reportedly backed the Senate candidate. "During the call, Rod Blagojevich stated, 'Unless I get something real good for [Senate Candidate 1], s--t, I'll just send myself, you know what I'm saying?' " the affidavit says. He later said, "I'm going to keep this Senate option for me a real possibility, you know, and therefore I can drive a hard bargain. You hear what I'm saying? And if I don't get what I want and I'm not satisfied with it, then I'll just take the Senate seat myself," according to the affidavit. The governor said the seat "is a f---ing valuable thing; you just don't give it away for nothing." "Blagojevich has also been intercepted conspiring to sell the Senate seat in exchange for his wife's placement on paid corporate boards or Rod Blagojevich's placement at a private foundation in a significant position with a substantial salary," the affidavit says. Intercepted phone calls indicate that the governor also has conspired to sell the Senate seat in exchange for millions of dollars in funding for "a nonprofit organization that he would start and that would employ him at a substantial salary after he left the governorship," according to the affidavit. Blagojevich and Harris threatened to withhold financial assistance from the Tribune Co. unless the company fired certain editorial board members who had been critical of Blagojevich and had called for the governor's impeachment. The money was related to the sale or financing of Wrigley Field, home stadium of the Chicago Cubs, a team owned by the Tribune Co. The governor instructed Harris to tell the Tribune's financial adviser that the assistance, which Blagojevich estimated to be worth at least $100 million, was contingent on the ouster of several board members. In a November 4 phone call, Blagojevich told Harris to tell the Tribune adviser, "Our recommendation is fire all those f---ing people, get 'em the f--- out of there and get us some editorial support." The affidavit gives only one name, Deputy Editorial Page Editor John McCormick. In a follow-up conversation, Harris said he had informed the adviser that the newspaper needed "wholesale changes"
"This is a priority. Stay on it, right. I mean, he, he gets the message, doesn't he?" Blagojevich asked. "Oh, yeah. He got it loud and clear," Harris reportedly replied. In another follow-up conversation, Harris said the Tribune owner told the financial adviser that he "was very sensitive to our concerns" and that certain cuts personnel cuts were imminent. On November 21, Harris said he had singled out McCormick "as somebody who was the most biased and unfair." Beginning November 30, Blagojevich began talking to a sports consultant and a Cubs officials about making state money available for Wrigley Field. On October 8, Blagojevich told a person described only as "Individual A" that he was willing to make $8 million available for Children's Memorial Hospital, but "I want to get [Hospital Executive 1] for 50." Individual A felt that Blagojevich was talking about a $50,000 campaign contribution from the hospital's chief executive officer and that the $8 million referred to a recent commitment by Blagojevich to secure state funds via "some type of pediatric care reimbursement." "Intercepted phone conversations between Rod Blagojevich and others indicate that Rod Blagojevich is contemplating rescinding his commitment of state funds to benefit Children's Memorial Hospital because Hospital Executive 1 has not made a recent campaign contribution," the affidavit says.